At Our Picks, we like Bose gear, it always comes with a slightly ‘unusual’ design and is always good quality. It appears that we are not alone with our Bose admiration as the Acoustimass 6 Home Entertainment system is currently the top selling surround sound system at Amazon with a 4.5 star rating too! So if you’re already convinced hit the link below, otherwise read on if you’re not so easily persuaded! 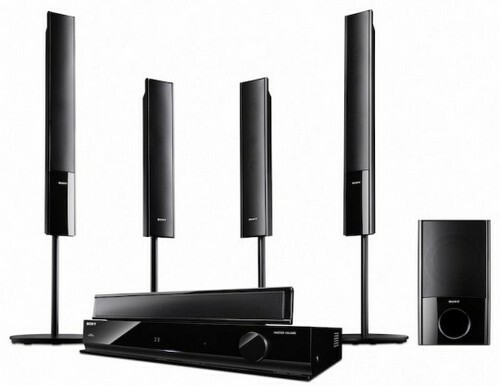 The slim line T Series speakers from KEF make their T305 Home Theatre System worth checking out. As well as being space-saving the 35mm thin speakers look stylish too and despite their small size they deliver on power. And in general the reviews say that the sound quality, which of course is what it’s all about, of the KEF T305 matches the stylish slimline looks. Interested? Then read on …. • 23.6 x 5.5 x 1.4 in; 3.3 lb. • 15 x 14.6 x 7 in; 28.6 lb. Whilst we struggled to find a lot of reviews for the KEF T305 Home Theatre System, the ones we did all gave it 5 out of 5. The only fly in the ointment was the cost but we feel in the speaker system market you do pay what you get for. Want better sound quality? You pay more money, as simple as that. So needless to say the KEF T305 Home Theatre Sound System package gets a big thumbs up from Our Picks. An average score of 5 out of 5 based on these 2 reviews. Unfortunately the Sony HT-SF470 won’t be out until June, but will be price tagged at around $550. It’ll be available from Sony stockists as well as Sony Style.